Hashim (right) and an officer hold up a poster during the visit. 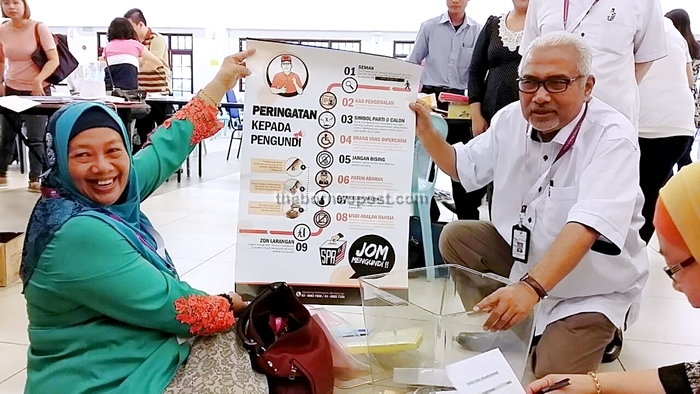 KUCHING: Election Commission (EC) chairman Datuk Seri Mohd Hashim Abdullah hopes to see a turnout rate of between 80 and 85 per cent for the 11th state election tomorrow (May 7). Met by reporters here today (May 6), he said although EC had earlier set the target at 75 per cent, he wanted to see an even higher percentage. “I hope voters will try to cast their votes early as it may rain in the evening. Bring an umbrella with you and if possible, make arrangements and leave your children at home,” he said after visiting the tallying centre for Batu Lintang at Dewan Masyarakat. Hashim said he was happy with the polling day preparation statewide, which would see about 21,000 election officers on duty. All polling centres open from 8am, while some of them close as early as 9.30am and the rest 2pm or 5pm, depending on the number of voters. To a question, Hashim said he would pray for those who were still not found after the chopper they boarded went missing yesterday evening. “In fact, all of them are my friends so you can imagine what I am feeling now. We shall all pray for their safe return and I pray that the search and rescue team will find them safe and sound as soon as possible,” he said. A total of 371 election officers will be on duty at Dewan Masyarakat alone tomorrow.